By 1938, after the annexation of Austria, Hitler set his sights on the Sudetenland of Czechoslovakia. He wanted to take this territory and make it a part of Germany, much like what he did with Austria. In doing so, he started up the Nazi propaganda machine and began spreading rumors that the German-speaking inhabitants of the Sudetenland were being mistreated by the Czechs. In an effort to calm Hitler and prevent a war, the Germany, the United Kingdom, France and Italy, though with the absence of Czechoslovakia, met in Munich, with the express purpose of discussing Nazi Germany’s continued aggression, and what to do with regards to the Sudetenland. Later on, this conference would be viewed as the epitome of appeasement and Allied refusal to confront the Nazis with military force. The signed agreement, in essence, allowed for Germany to take control of the Sudetenland, and consolidate all Sudeten Germans into one Germany, without invading the rest of Czechoslovakia. The agreement rode on a huge amount of trust, but, for the short term, it seemed that The Munich Agreement had ensured lasting peace in Europe. 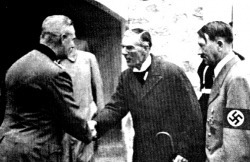 As Neville Chamberlain himself famously proclaimed: “We have ensured peace in our times.” The inaccuracies of this statement would come to be revealed only with time. For the most part, the concepts of: cooperation, internationalism, nationalism, regional security, appeasement, and expansionism were involved in the Munich Conference. The Munich Conference is one of the many examples of appeasement of the Germans, and how the powers of Europe let Germany become powerful again by ignoring the sure signs of the breakout of war. The Munich Conference was said to be one final test of Hitler’s ability to keep his word. Thus, the major powers of Europe were diplomatic in their attempts to defuse any potential conflict concerning the Sudetenland. Hitler used the resulting nationalism from his propaganda campaign to put together a case against the Czechs, and was ready to invade to achieve his goals of uniting Germans. Hitler wanted to expand his territory into Czechoslovakia, and used the existence of the Sudetenland, and the resulting nationalism of isolated Germans to further his arguments and convince everyone that Sudeten Germans must be united with the motherland. In the name of regional security, the powers of Europe were then cooperative, following principles of internationalism, in ensuring, diplomatically, that Germany got what it wanted, and that war did not break out. The powers of Europe were so intent on avoiding war that they signed the agreement without much foresight or attention to what was really happening. They can be said to be appeasing the Germans by supplying their demands without second thought. In the short term, it seemed that appeasing the Germans diverted the inevitable war, and there was much celebration due to the prospect of continued peace. However, the continued violations of European treaties and agreements, the Munich Agreement included, served to heighten tensions and to add to Germany’s feelings of invincibility. As such, it can be concluded that the Munich Conference contributed to the start of World War Two by proving to Hitler that Europe was truly his, and any endeavours he chose to embark on would simply be approved by the other European powers.